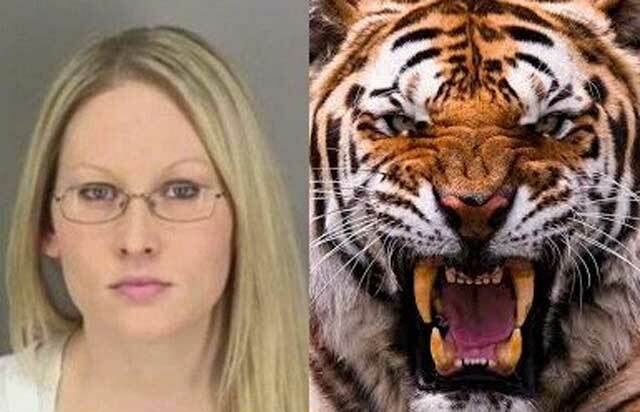 Jacqueline Eide, who was bitten by a tiger at Henry Doorly Zoo in Omaha, Nebraska, in November, was arrested on Saturday by Omaha police and appeared in court on Monday. Bond was set at $25,000 for Eide who was charged with having an open container of liquor in a public place and disorderly conduct. Police called to investigate a disturbance just before 4 pm found Eide holding a cup while staggering in the street. Officers said she was intoxicated and behaving irrationally. Eide said she was drinking vodka with orange juice. A witness told police Eide had approached two teens painting at an apartment complex, grabbed them from behind and tried to hug them. 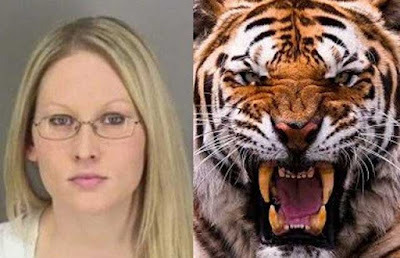 She was taken to police headquarters where she was said to be verbally abusive, threatened to kill the officers' family members and tried to bite an officer. Eide's Attorney James Martin Davis said his client has an alcohol problem and doesn't remember the incident. "This is the second incident where she's gotten in trouble where she had been drinking excessively," said Davis. "She said she was blacked out. So obviously there's problems with alcohol related to this." Eide pleaded not guilty in December to charges of trespassing, contributing to the delinquency of a child and criminal mischief in connection to the zoo incident. She is due back in court for those charges on April 4th.